Abdel Hameed al-Yousef woke to the sound of an early morning bombardment in the northern Syrian town of Khan Sheikhoun and told his wife Dalal to take their twins Aya and Ahmed to safety outside. He emerged to find the home covered in dust, and then a new strike exploded about 400 yards (300 meters away). Within minutes, he said, his eyes started to water, and he soon lost consciousness. "I estimate I came to about five hours later, he said. "And I had lost 19 of my close relatives. They were all on the ground." Eventually, "They found Ahmed, Aya and my wife and four other people near my house," the 29-year-old shopkeeper recalled. They were among the nearly 90 people who died from what U.S. and other experts have determined was a Syrian government attack using sarin, an outlawed nerve toxin. While the Syrian government denied the attack and its Russian ally suggested the toxic agents were released when a bomb hit a rebel chemical weapons arsenal, the U.S. government responded with a barrage of 59 cruise missiles against Shayrat air base in central Syria that apparently had been used in the gas attack. For the bereaved al-Yousef, speaking to The Associated Press after fleeing across the border to the southern Turkish province of Hatay, the retaliation wasn't enough. "We thought he (U.S. President Donald Trump) would strike all the air bases," al-Yousef said. "Striking one is not enough." Even the one may still be operational. Opposition activists said on Saturday that Syrian warplanes took off from Shayrat air base, despite the U.S. missile strike. The Syrian civil war, now it's in its sixth year, has left an estimated 400,000 people dead. Al-Yousef wants the bloodshed to end. "What I want is for this waterfall of blood to end, for my people to live a good life, like humans, free and with justice. I want this cruelty to end and to go back to living how we used to," he said. He frequently glanced at the photographs of his lost wife and children saved on his cellphone. "My goal from now on," he said, "will be to tell everybody what I have lived through." 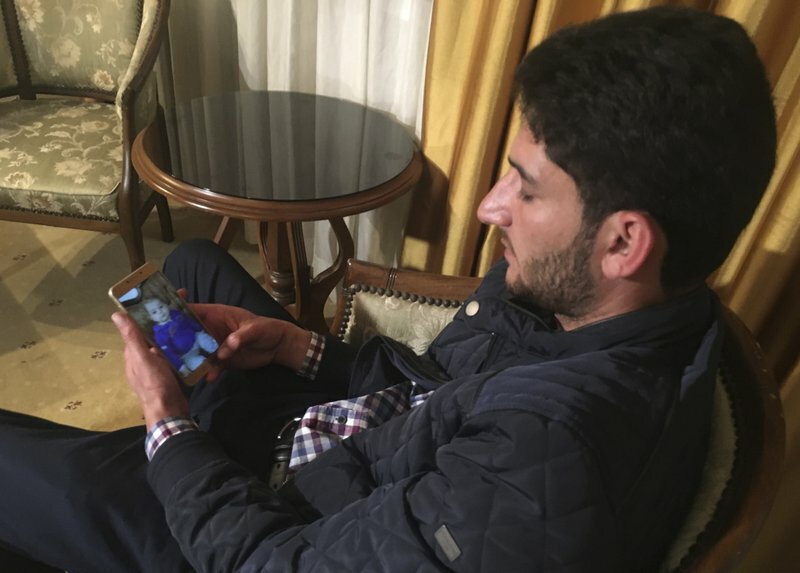 Abdel Hameed Alyousef, 29, of Khan Sheikhoun, Syria, looks at photographs of his deceased children on his cell phone showing a photo of his deceased son Ahmed, in Antakya, southeastern Turkey, late Friday, April 7, 2017. His wife Dalal and his 9-month-old twins Aya and Ahmed, along with other members of his family were all killed in Tuesday's chemical weapon attack on the Syrian town that killed some 87 people. The human cost of the attack is evident as Alyousef says 'I had lost 19 of my close relatives' in the attack which has been widely blamed on Syrian President Bashar Assad's regime, although Syria officially denied using chemical weapons. Abdel Hameed Alyousef, 29, of Khan Sheikhoun, Syria, looks at photographs of his deceased son Ahmed, in Antakya, southeastern Turkey, late Friday, April 7, 2017. 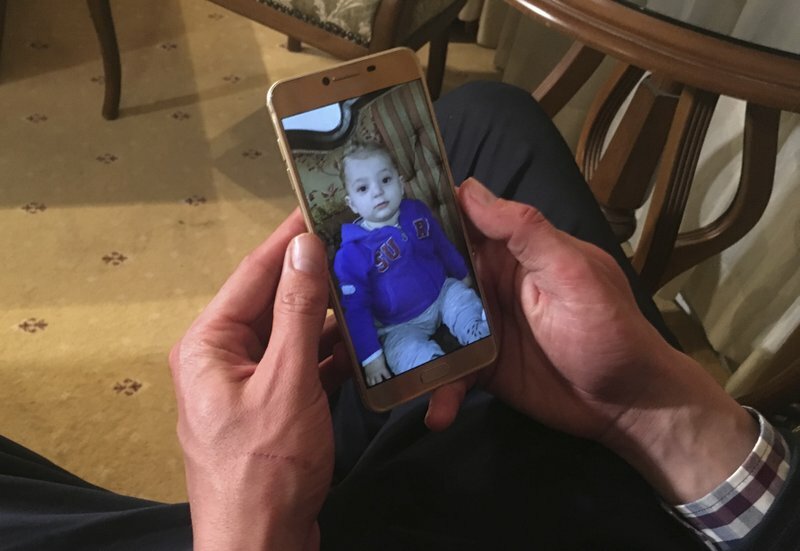 His wife Dalal and his 9-month-old twins Aya and Ahmed, along with other members of his family were all killed in Tuesday's chemical weapon attack on the Syrian town that killed some 87 people. 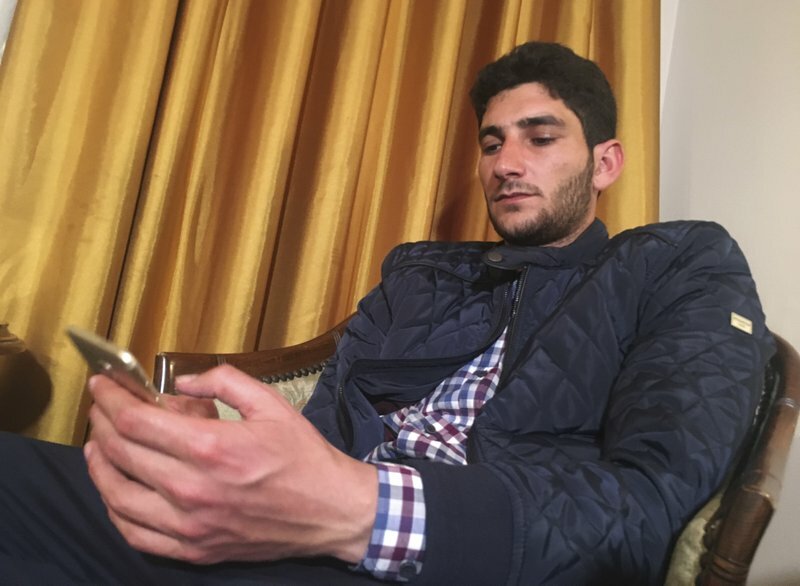 The human cost of the attack is evident as Alyousef says 'I had lost 19 of my close relatives' in the attack which has been widely blamed on Syrian President Bashar Assad's regime, although Syria officially denied using chemical weapons.